Geneva Steel, in Vineyard, Utah, opened in the 1940s to mill steel for use in WW2 war ships. It slowly declined after its heyday, despite efforts by local businessmen to keep it running and profitable. Chris Dunker was initially granted permission to photograph Geneva Steel in exchange for taking portraits of the corporate bigwigs. He started documenting the place in earnest in 2004, through its closure, dismantling, and demolition in 2007. This catalog is a beautiful chronology of images, dramatizing the grand collapse of the steel industry in Utah County. Diana Turnbow’s essay places Dunker squarely in the tradition of 20th century industrial photographers such as Charles Sheeler and Margaret Bourke-White. Dunker, however, is not documenting the utopian era of progress and industry. Really, he is not strictly documenting its failure and collapse, either. He uses a similar visual language of monumentality, dramatic lighting, and atmospheric dust, but has created a nostalgic “visual elegy” of an industry, and a specific place. Dunker uses large format cameras as well as photoshop and digital printing to make these images. Most of the time they are captivating but in a few cases somewhat over the top. His composition style is quite formal — lots of symmetry and dramatic angles. The scale of most of these images is monumental, and even printed in the catalog they are grand. Dunker’s exterior images of the steel plant are bleak, muted compositions, investigations of positive and negative space where pipes, chimneys and roof lines meet blank gray skies. The sun doesn’t shine in Chris Dunker’s Utah County. The interiors are all saturated colors revealing a very Alienesque (as in the movie) quality. 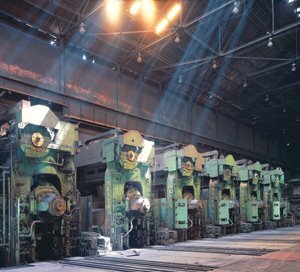 Coils of tubing, metal grates, deep saturated greens and oranges… you wonder if Ridley Scott toured a steel mill before designing his space ship. Clearly, though, Dunker is saturating his colors to create effect. It is easy to read #1 Blast Furnace, 2004 as a Star Trekkian “heart”. Or Blast Furnace Ducts, 2004 as arteries. Many of these images are timeless (in a 20th century kind of way) in terms of the physicality of the machines — huge gears and complex networks of hoses. Not at all a world of computers or nano-technology, it is industrial and gritty. One of the most powerful images from the catalog that hints at the effect of the closing on the community is Central Maintenance Change Room, 2006. Workers’ clothing hangs from vertical ceiling mounted hooks, filling a room with empty clothes. Knowing that the plant was closed, you wonder if the workers left in great haste, with personal items forgotten. Even in this haunting image, however, it is the formal qualities that dominate. The extreme angles of the room, the bench in the foreground, and blown out light from the windows, exaggerating the shadows within. As the chronology of the images proceed, they take on a more apocalyptic air. The final image Q-BOP Vessel Dismantle, 2006 is almost overrun with demonstrating the end of the world — a purple sky hangs over a sideways broken vessel that has puked up bricks. Chris Dunker has an incredible eye for composition. Making the images large completes the feeling of being enveloped in this place. And he tells a compelling story. However, his touch with color is sometimes and too often heavy-handed and I leave the book wishing the artist was a little more honest with color and a little less nostalgic for the industrial age. Available at the Museum of Art store. Can Someone Steal Your Orphaned Artworks?